Edwin Thulo Mahlatsi was born on a farm in the Bothaville district. Both his parents were farm workers. He was born on 2 August 1942 and is 74 years old. He attended a farm school and passed Grade 6. When the farm Edwin grew up on was purchased by Mr Frikkie Rautenbach, he stayed on as a farm worker. As he puts it: ‘Ntate Rautenbach bought me with the farm’. He has 40 years of working experience in agriculture and has the following experience: Cash crops, managing a beef herd and sheep production. Mr Danie van den Berg, who evaluated this farmer, said the following about Edwin: ‘He is a farmer by heart, and is probably one of the very few I have met that has the most farming experience across the spectrum. 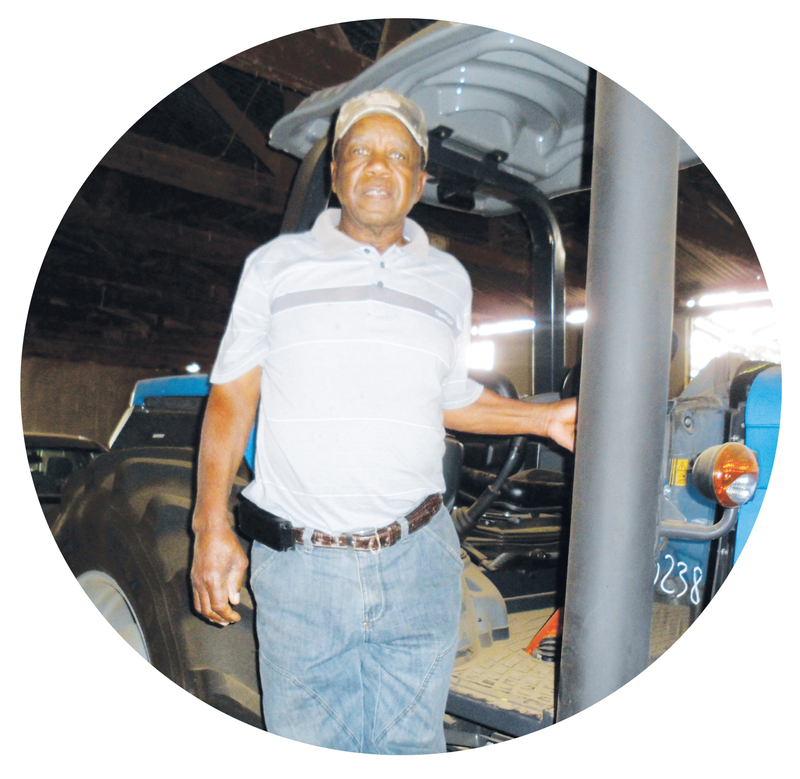 He has been involved in farming from a very young age and was coached and trained by a well-known farmer in the Bothaville district for a period that spans over 40 years’. The farm Swartlaagte is 463 ha in size and has 208 ha of arable land and 255 ha of grazing. The farm was acquired in 2014 through the government’s proactive land acquisition strategy of the PLAS scheme. From 2012 to 2014 Edwin was given the opportunity to farm in partnership with his former employer. This came to an end when his former employer passed away. Unfortunately for Edwin all the implements, tractors and the pick-up van used during these years belonged to his former employer and had to handed back to the estate. Edwin has been a member of the Grain SA Farmer Development Programme since 2012. He is an active member of the Bothaville Study Group. He has attended four training courses with Grain SA, which include: Introduction to Maize Production, Resource Assessment and Farm Planning, Farming for Profits and Business Ethics. His daughter, Doreen has attended an Introduction to Sorghum Production Course and Farming for Profits, as she is very interested in Agriculture. He has planted 137 ha of maize this 2015/2016 season, but plans to plant 208 ha in the 2016/2017 season. Edwin has 35 beef cows, 3 bulls and 18 calves. He also has 118 ewes, 2 rams and 45 lambs. Edwin was part of the 2015/2016 Recapitalisation Project managed in partnership with the Department of Rural Development and Land Reform, Grain SA and the farmer. This grant from the Government has enabled him to buy a tractor, planter, boom sprayer, ripper, disc and two trailers. He also bought input supplies to be able to plant 137 ha of maize. With the support from his mentor, Christiaan Bouwer, the work has gone well. He is one of the few farmers who have harvested a crop this year. This was his first year of planting on his own and he will at least become part of the Grain SA 250 Ton Club. He has suffered 41% hail damage but still managed to harvest 2,4 t/ha. He could have averaged 4 t/ha. The maize was insured for 4 t/ha at R4 000/ton. ‘My success I attribute to the fact that agriculture is all I know. Grain SA has been there for me with training and support. They have helped me to become part of the Recap Project and blessed me with a mentor who is so good. My neighbours also help me a lot’, says Edwin. Edwin is motivated by the dream to be successful. He wants to be able to look after himself and not stand with his hat in his hands, looking for hand-outs. ‘My strength is my knowledge, my good health, my children and my support system all over the agricultural sector. I wish I could work a computer and read and write better’. In five years time Edwin hopes that his daughter can take over a sustainable farming operation and carry on and grow bigger and stronger. He further wishes that the government can manage to get the crime under control as someone recently stole and slaughtered 16 of his pregnant ewes. Edwin’s advice to young people is: ‘They should be humble and respect the land and its resources. Money and big shiny cars are not the be all and end all. If your stomach is empty, you will die. Hard word, hard work, hard work. Listen, look, learn and then do – that is the way, and always thank God for what you have. Article submitted by Johan Kriel, Development Co-ordinator of the Grain SA Farmer Development Programme. For more information, send an email to johank@grainsa.co.za.